This type of suspension was the major one in the 50s,60 and 70s. USA companies were the leading force of speaker industry with several 'best buy' CB realizations. In a previous section we asserted that rear-side radiation actually propagates into the enclosure's volume. The question is how the cabinet's air reacts to diaphragm motion. Physics state that air in a confined space (air-tight, non leaky) behaves like a compressible fluid. If you exert a force upon an area of this volume it will be compressed. Such a behaviour is similar to a spring. So air in a closed box behaves to a good approximation like a spring; it reacts to compression. Therefore every air-volume features a stiffness or compliance coefficient. A small 5-lt box will be very stiff; it will strongly react to compression imposed by woofer cone excursion. So small volumes have a large stiffness (and a low compliance, the inverse of stiffness) coefficient. A large 70-lt cabinet will be soft to compress and decompress; it will have a high value of compliance (small stiffness) coefficient. Compliance of a spring expresses the easiness with which it is compressed and decompressed by forces. Enclosure compliance gets its own symbol in loudspeaker physics: Cme. Obviously enclosure stiffness adds to woofer suspension stiffness. Woofer cone motion is further confined by enclosure reaction forces. Overall system's stiffness is increased and woofer cone resonance frequency rises. -Could we summarize the quantitative effects of enclosure's air volume on woofer cone mass-spring system and its frequency responses ? As in quality factors, combining two compliance values with the expression above will result in a lower total value. For example let us take a small woofer with Cms=0.8mm/N and mount it on a cabinet the air of which exhibit an equal compliance value Cme=0.8mm/N. The overall compliance will be much lower; half of these values : Cmt=0.4mm/N. This means that woofer diaphragm will confront stiffer forces throughout its oscillatory motion. Since total compliance Cmt is now lower than Cms we understand that the new resonance frequency fo is higher than driver's fs. -Could we have an example ? Cme = Ve / (po*co^2*Sd^2) where Ve is the enclosure's air volume, po is air density, co is sound propagation speed in air and Sd the driver's diaphragm area. The leftmost curve relates to unmounted woofer (fs=35Hz) while the rightmost curve belongs to the final CB system (fo=50Hz). -Could we have a handy formula to evaluate the final CB system resonance freq.fo ? In this example with driver's Cms to equal the air-volume's compliance Cme, the expression in the square root equals two. thenge we get fo/fs to be 1.41. 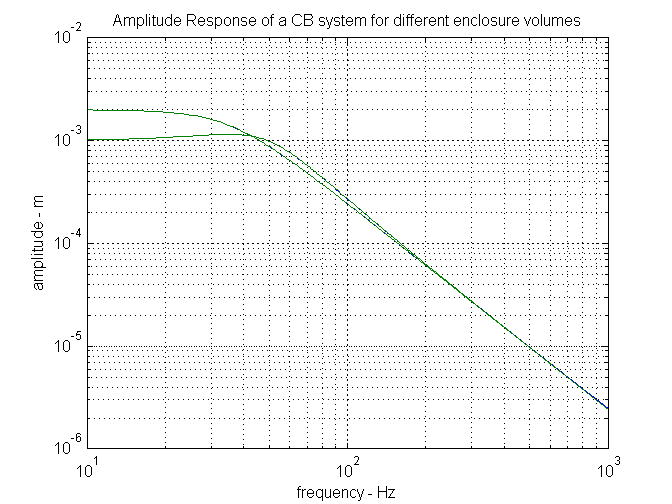 This means that CB resonance fo is 41% above the driver's fs=35Hz ie. at 50Hz approximately. A close investigation of last figure will verify the results. -Why maximum velocity of the final CB system does not change ? We said before that maximum value of velocity response relates only to mechanical resistances (damping). enclosure's air volume does not add any serious value of damping. Research engineers have given an approximate estimate of mechanical resistance and energy losses associated to CB enclosures through a quality factor that can be used : Qa = 10. Its high value corresponds to very low mechanical resistance. -What about the SPL response of the final CB system ? 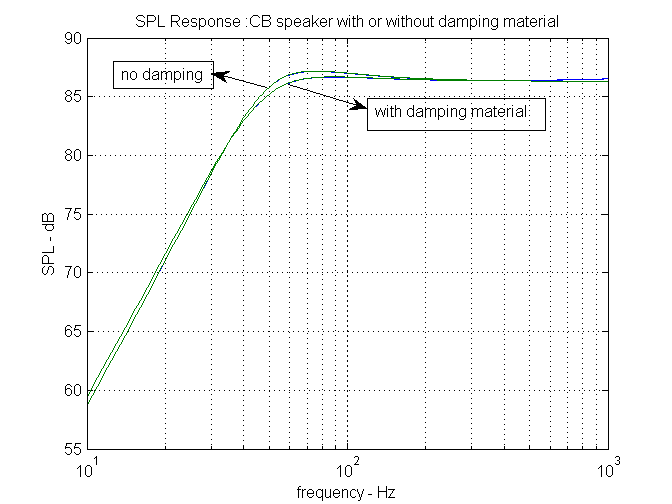 This figure addresses the SPL response of 8'' woofer driver mentioned in the previous example. 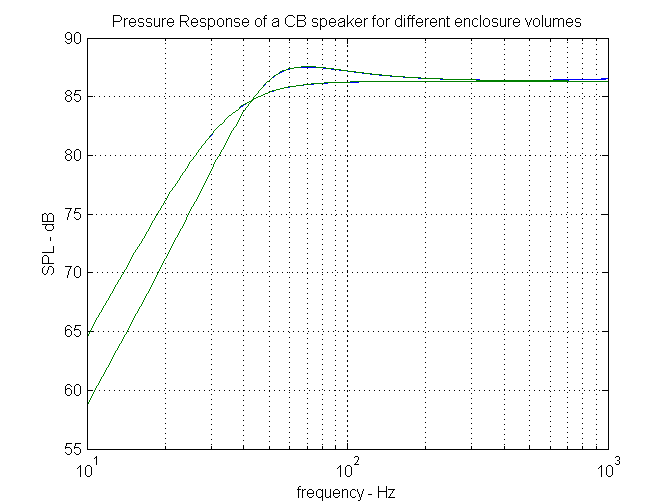 The leftmost curve stands for the driver alone (no air-volume, fs=35Hz) while the rightmost depicts the final CB system's response for enclosure volume of 40lt (fo=50Hz). Except for SPL response shifting to higher frequencies we observe that damping in the final CB system is now less efficient to control the higher resonance frequency. A resonance peak is now formed. Quality factor of the CB system is obviously worse compared to the woofer driver alone. In our example the 8'' woofer driver has a Qts value of 0.71 approximately (very good in terms of damping). However mounting it on a 40lt CB design increases resonance frequency to 50Hz at which damping is less efficient and the quality factor increases to Qt=1.00. -What can be done ? introduction of additional mechanical resistance (damping) by means of filling the enclosure's volume with sound absorbing material. -Could we elaborate on the last choice ? 1/Qtc = 1/Qa + 1/Qt => Qtc=0.83. Such a value of quality factor is quite acceptable; the resonance peak of the SPL curve is barely detectable. -Is Q shifting the only consequence of filling a CB speaker with sound absorbing material ? Older Electroacoustics' research states that sound propagation speed is reduced in spaces filled with such material by a factor of 10% approximately. This makes filled volume 'seem' larger than it really is by twice the same factor. In our example a CB cabinet of 40lt filled with such a material becomes acoustically equivalent to 48lt! All these aspects of a CB system are covered from a design point of view in the relative section of another tutorial article : the design framework. -Do resonance frequencies fs,fo equal the cutoff frequencies ? Generally speaking no. 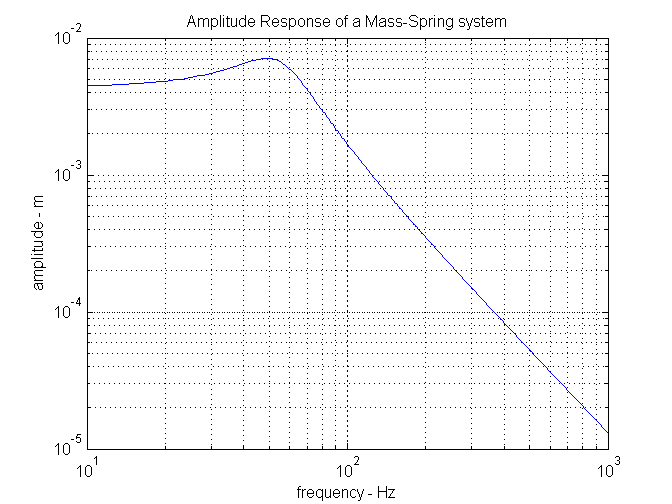 A resonance frequency coincides with the cutoff (-3dB) frequency only at the special case of critical damping Q=0.707. We need further formulation for computing the cutoff frequency. Such an formulation is offered in the previously mentioned tutorial article on design framework. -How much power in Watts can a CB design withstand before woofer exceeds its maximum cone excursion limit ? Before answering this question it is interesting to have a close look on the oscillation amplitude of a woofer cone in a CB enclosure. Following figure depicts such an oscillation amplitude versus frequency. we can see that above resonance amplitude decreases rapidly. That is why the most dangerous signal frequencies for CB speakers lie in the range zero to resonance fo. In this case amplitude varies from 4.5mm to 7mm for 1 Watt input in this frequency range. The CB design in this figure features a rather underdamped resonance producing a peak around resonance. 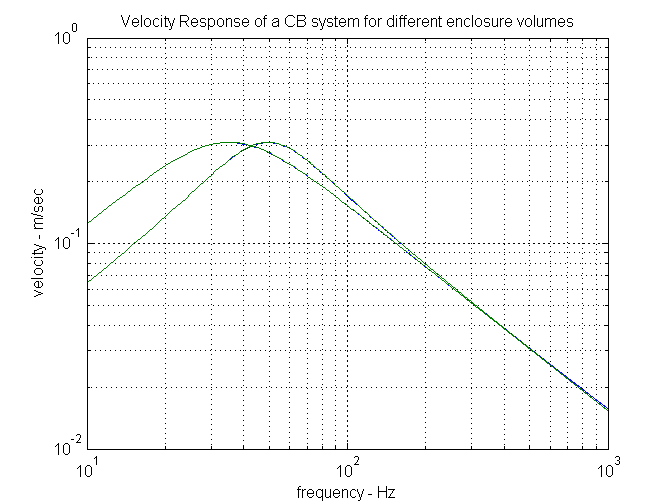 Another rule in CB oscillation amplitudes is that less volume leads to less cone excursion. The following figure gives two osc.amplitude plots for different enclosure volumes. The upper green curve gives a higher max.amplitude value at 2mm and corresponds to a higher enclosure volume. We know that this plot has been evaluated for an electrical input of 2.83 Volt rms (1 Watt for 8 Ohm speakers). Amplitude values in such simulations describe rms amplitudes not peak values. To find the peak value we simply take the rms and multiply by the square root of two. In this case an rms value of 2mm corresponds to a peak cone excursion of 2.83mm in the 'fatal' range 0-20Hz. We also know that maximum acceptable cone excursion for this driver is 5.5mm peak. Thus we only need a division to reveal that our 5.5mm peak limit will be reached as soon as we double input voltage. In this case 5.66 Volts rms (4Watt) below 20Hz will stretch our cone suspension to its limits.